The start with having a green datacenter was reducing energy consumption. Then we got the mission of reducing carbon emission and now there is the start of reducing water consumption (see the new sustainability metrics of the Green Grid). The next step will certainly be e-waste. We all know that E-waste is serious business and if not proper handled it can cause severe environmental damage and harm to human health. But there is also another side of the E-waste coin. E-waste is also about wasting rare earth metals. The use of rare earth elements in IT technology has increased dramatically over the past years. New, advanced battery, magnet and optoelectronics technology is depending on the use of these rare earth metals. Rare earth magnets are small, lightweight, and have high magnetic strength so have become a key part of the miniaturization of electronic products. The key rare earth metals in magnets are neodymium, praseodymium and dysprosium. For example neodymium is an important metal for hard disks. Another major use of rare earth oxides is in metal alloys. High performance alloys involving rare earth metals have an important uses in computer memory chips. Rare earth metals (particularly erbium) also act as laser amplifiers in increasingly important fibre optic communication cables. Through the 1950s, South Africa was the world’s rare earth source, using the rare earth metals bearing monazite mineral. 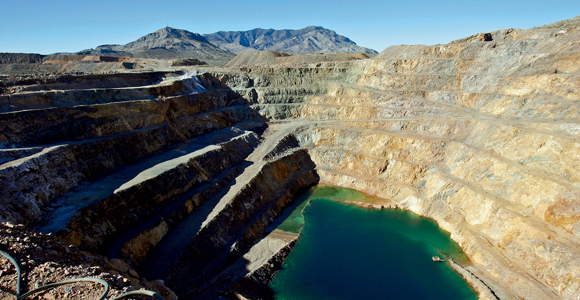 From the 1960s until the 1980s, the Mountain Pase mine in California was the leading producer. 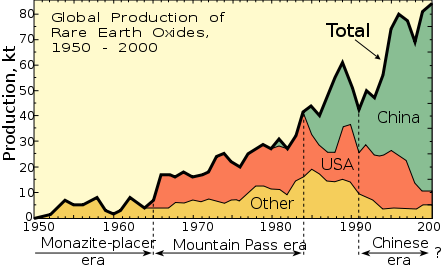 At the current moment all these resources are dwarfed by the scale of Chinese Bayan Obo mines who are responsible for 45% of global rare earth metal production as you can see in the diagram below. This makes you think twice about Green IT and E-waste. Rare earth metals are costly and difficult to produce in an environmentally safe way so there is a limited supply of the minerals in the marketplace and then at end of the life cycle we throw these precious and rare metals away and causing price increase and severe environmental damage in all parts of the world?! We had (see the other blogs about E-waste) already found legislative obligations and moral obligations (environment, crime fighting) to do something about E-waste and now we have also financial and economical reasons.What reasons do we want to have more to take action and have a proper decommissioning of IT components? This entry was posted in E-waste, Green Data Center, Green IT and tagged e-waste, Green Data Center, Green IT by Infrarati. Bookmark the permalink.